On Monday night, Mike Moustakas established a new precedent for what we call a “career night.” After being named the Texas League Player of the Year earlier in the day, Moustakas lead the Royals’ AAA affiliate Omaha Royals to a 23-5 route of the Round Rock Express that featured 25 hits, 11 of which went for extra bases. Since being selected 2nd overall in the 2007 draft, Moustakas has mashed his way through the Royals minor league system, and Monday’s performance only further solidified his place at the hot corner in 2011. That’s right, Mike Moustakas drove in 11 runs in a 9-inning game, something that is essentially impossible to do even in the most flawed video games. Of his 3 home runs, he belted 2 of them in the bottom of the 3rd, an inning in which his team pushed across 11 runs and quickly turned a 3-2 Omaha lead into a 14-2 route. Prior to Monday night’s game, Moustakas was named the Texas League Player of the Year after hitting .347 with 25 2B, 21 HR, 76 RBI- 1.100 OPS- in 259 at-bats for the Northwest Arkansas Naturals. 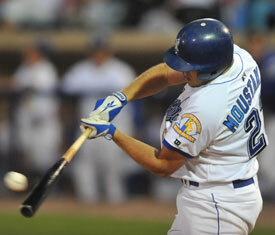 Since his promotion to AAA Omaha, Moustakas is hitting .297 with 13 HR and 43 RBI- .826 OPS- in just 195 at-bats. Is Aroldis Chapman the nastiest reliever in baseball? White Sox Thornton to DL, Chris Sale to close?